Newcastle XI: Elliot, Janmaat, Mbemba, Coloccini, Dummett, Sissoko, Tiote, Anita, Wijnaldum, Mitrovic, Perez. Stoke XI: Butland, Johnson, Shawcross, Wollscheid, Pieters, Adam, Whelan, Shaqiri, Krkic, Arnautovic, Walters. No. No-one can beat Jack Butland today. He's been immense for Stoke and the main reason his side are leaving St James' Park with a point. That's it from this game but you can catch all the reaction to Saturday's games right here. There will be four minutes of added time for someone to grab a winner. Can anyone beat Jack Butland today? Jack Butland is at it again. Substitute Jamaal Lascelles gets on the end of a free-kick and almost makes an immediate impact only for his header to be tipped over the bar. Jack Butland is only enhancing his reputation here. Magpies midfielder Moussa Sissoko powers a shot at goal and Butland tips it over. Daryl Janmaat comes off and is replaced by Jamaal Lascelles. Stoke striker Jon Walters controls a Xherdan Shaquiri pass on his chest and tries to half-volley a shot at goal on the turn but his effort goes over. Newcastle defender Daryl Janmaat signals to the bench that he's going to have to come off with an injury. He's off the field and Stoke try to take advantage but Marko Arnautovic has a cross blocked by Fabricio Coloccini, who threw himself in front of the ball. Newcastle boss Steve McClaren brings on midfielder Siem de Jong for Cheick Tiote. Aleksandar Mitrovic is making a proper nuisance of himself as he's brought down by Stoke defender Ryan Shawcross. Referee Roger East has a word with the Potters defender but no yellow card. Aleksandar Mitrovic is also turning out to be a bit of character. He goes down clutching his face after clashing with Philipp Wollscheid but it's an over-reaction to say the least. Both players are booked. Stoke boss Mark Hughes takes off Bojan Krkic and brings on Ibrahim Afellay. Stoke keeper Jack Butland is by far the busier keeper and he's in the thick of the action again as he palms an Ayoze Perez shot wide. Is he going to blow? Aleksandar Mitrovic was given a talking to before that last chance after clashing with Stoke defender Ryan Shawcross. Moussa Sissoko plays a one-two with Georginio Wijnaldum and is through on goal but on-rushing keeper Jack Butland manages to get enough of a touch to the midfielder's shot to help the ball bounce over. Chancel Mbemba heads narrowly wide at the near post from the resulting corner. This time it's Stoke who go close. Marko Arnautovic swings in a cross for Jon Walters, whose initial header is well saved by keeper Rob Elliot before the Stoke striker's follow-up volley goes wildly over. Stoke keeper Jack Butland needs to be alert again to tip a Georginio Wijnaldum 25-yard free-kick over his crossbar. Newcastle forward Ayoze Perez tries to curl a shot into the far corner and his effort is well struck but goes wide. Stoke keeper Jack Butland appeared to have to covered. The possession graphic below shows things at St James' Park were pretty even in the first half. You could say both teams have been as bad as each other!! David: The only winners at the Newcastle v Stoke game are the clever fans who stayed away. It's a shocking display. Tom: Newcastle v Stoke had ZERO time added after 45 minutes. When did that last happen? It looked like we might have been in for a good game at St James' Park to start with but, apart from that Aleksandar Mitrovic header coming back off the Stoke post, it's faded into a bit of a low-key affair. Both these teams are just lacking a bit of quality to make the most of any promising situations at the moment. Bojan Krkic and Xherdan Shaquiri struggling to make an impact for Stoke. Ayoze Perez goes down in the Stoke area after showing some nimble footwork but any hopes of him thinking he might get a penalty are wiped away by referee Roger East. The Newcastle forward also gets an earful from Stoke defender Ryan Shawcross, who was unhappy at Perez's antics. Stoke midfielder Charlie Adam tries an ambitious 35-yarder and it goes well over. The Potters are being well marshalled at the moment. Aleksandar Mitrovic is a bit of a powerhouse and he gets on the end of a cross from the left only to see his flicked header came back off the post. Georginio Wijnaldum tries to pounce on the rebound but Stoke keeper Jack Butland and his defence scramble the ball clear. Stoke attack with Charlie Adam and he finds Jon Walters but his pass out wide wrong-foots Xherdan Shaqiri, who shows a bit of frustration. Stoke City may have made the long trip to the north east this afternoon, but it's a home game for injured defender Marc Muniesa. Stoke have a couple of corners cleared before Adam whips in a low cross from the left flank and, even though Magpies defender Chancel Mbemba misses it, Stoke striker Jon Walters can't capitalise as he fails to make contact at the far post as well. Ayoze Perez tries to slide a pass through to Moussa Sissoko but Stoke centre-back Philipp Wollscheid does well to intercept it and clear the ball away for a corner. Newcastle have won three of their last four matches against Stoke at St James' Park, drawing the other. Stoke, along with Arsenal, have received the least amount of yellow cards in the top flight this season (14). Stoke are aiming to win three successive away games for the first time in the Premier League. The last time they won three consecutive top-flight away matches was in 1975. Lively. Very lively. This game has already got a bit of a frenetic feel about it. Aleksandar Mitrovic appears up for it today - when doesn't he - and he has a shot deflected over for a corner. Aleksandar Mitrovic cuts inside from the left and has a pop at goal but his low shot is saved by keeper Jack Butland. At the other end, Paul Dummett looks like he clips Bojan Krkic right on the edge of the area but referee Roger east waves play on. We've had an open start to the game. A Newcastle attack broke down and Stoke counter-attacked with Bjoan Krkic and Xherdan Shaqiri as they were also thwarted. 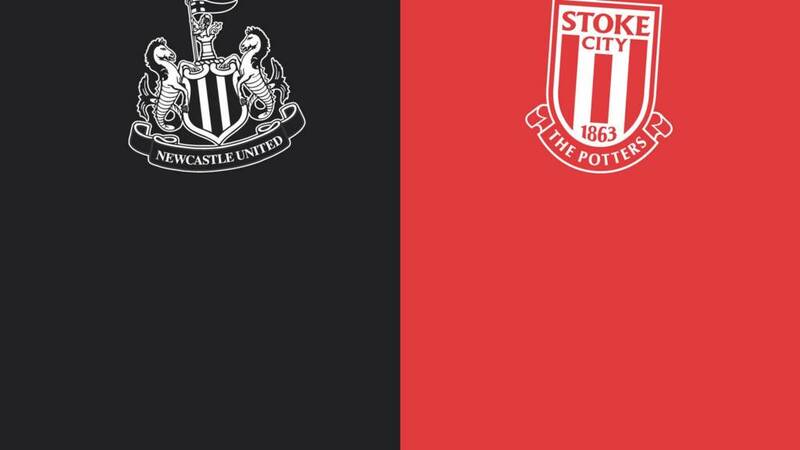 We're under way at St James' Park as Newcastle, who are 19th, host 14th-placed Stoke..
"Stoke's results have been similar to they were under Tony Pulis. Overall they'll have to spend significantly if they are going to move up to the next level. They don't have the funds to get to that next level. They're a good side to watch and they've got players in that side who are exciting, but it comes back to the tried and tested players like Jon Walters." Newcastle can be a bit of a soap opera at times but Stoke manager Mark Hughes has backed his counterpart Steve McClaren to succeed at St James' Park. "There are huge demands and it seems to be a club that sways from one issue to another," said Hughes. "It seems there is a little bit of noise that surrounds the club and that that has been the case for any number of years. "Whoever is the manager has to deal with that and it is sometimes the issues off the field rather than on the field that seem to take up their time. "But Steve is a very experienced manager who has been through these kinds of periods before. Steve will be looking to turn things around very quickly - and I'm sure he will." Newcastle might have lost to rivals Sunderland last week but they looked the better side before going behind and events going rapidly downhill for them after centre-back Fabricio Coloccini being sent off. "If we play like that and keep 11 players on the pitch, we will win eight or nine out of 10 games. You can see the progress. Some of our football was fantastic and that's progress. "You don't have to be rocket scientists and experts in football to know that we dominated that game. We felt a lot of injustice against us. "But you can't feel sorry for yourselves and you have to get back to work. We have done that, I think the fans have moved on quickly and what we have got to do is keep reproducing those performances week in, week out. Defender Steven Taylor, sidelined with injury today, swapped his boots for a mic this morning at St James' Park. Can Newcastle overcome sense of injustice? "Having had all week to reflect on the derby defeat and overcome their feeling of injustice, Newcastle will look to start afresh once more and build on their solitary victory so far under Steve McClaren. "They will take confidence from the way they had played before Fabricio Coloccini's red card at the Stadium of Light, as they look for the boost of back-to-back victories at St James' Park. "Stoke will have a point of their own to prove after their uncharacteristic defeat by Watford. "They have been strong away from the Potteries and will be even stronger with Ryan Shawcross's presence and leadership available again. Mark Hughes won't accept a repeat of last weekend." Newcastle boss Steve McClaren makes one enforced change from the derby defeat at Sunderland last time out as midfielder Vurnon Anita replaces the injured Jack Colback. Centre-back Fabricio Coloccini starts after having his red card from the game last week overturned. Subs: Cisse, De Jong, Gouffran, Lascelles, Haidara, Thauvin, Woodman. Stoke centre-back Ryan Shawcross returned from injury in midweek Capital One Cup win over Chelsea and he came through unscathed to start his first league game of the campaign today. Potters boss Mark Hughes makes four changes from the side which beat Chelsea as defenders Glen Johnson and Erik Pieters return to the starting line-up along with playmakers Bojan Krkic and Xherdan Shaqiri. Stoke City XI: Butland, Johnson, Shawcross, Wollscheid, Pieters, Adam, Whelan, Shaqiri, Krkic, Arnautovic, Walters. Subs: Ireland, Wilson, Afellay, van Ginkel, Diouf, Crouch, Haugaard. These sides both had a bit of an early Halloween horror result in their last league outings as Newcastle suffered another derby defeat at Sunderland, while Stoke were beaten by Watford. While the Magpies have been stewing all week after their loss, the Potters bounced back by knocking Chelsea out of the Capital One Cup after a penalty shoot-out.